1967 1967 Lone Star Limited Edition Mustang was territorial special for Texas just as the High Country Special was for Denver and the California Special for California. They came with a special Blue Bonnet paint - they came to be known by the name Bluebonnet Special. 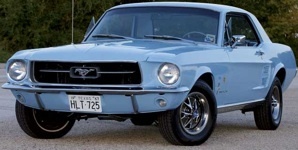 All 175 Lone Star Mustangs were hardtops, had the sprint options package, blue luxury interior, steel styled wheels, 200ci in-line six or 289ci V8 engine, and had a gold Lone Star Limited fender badge.